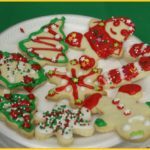 This year’s Cookies with Santa event attracted close to 75 volunteers – as many, if not more, than 2017, say organizers of the fun event for foster children and families of Winnipeg Child and Family Services. 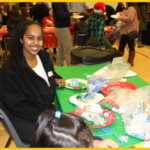 “We had a total of 73 volunteers who helped make Cookies with Santa as magical as it could be,” said Debbie Smith, co-ordinator, Volunteer Connections, with WCFS. This year marked the eighth annual Cookies with Santa evening. HOPE Worldwide Canada provided 22 of this year’s volunteers, who did everything from helping with Christmas crafts to playing games and activities with the children. It creates programs and engages volunteers to help meet needs in the community. David Jung, a pastor and member of the HOPE team, said they got involved several years ago when they began helping WCFS conduct a life skills program for youths transitioning out of care at WCFS. The HOPE team also helps out with many other WCFS events throughout the year, including the KIDs in Kare Picnic, stocking CFS food pantries and rebuilding a playground at a women’s shelter. HOPE also runs a day camp for foster children for two weeks each summer. Jung said Cookies with Santa is a nice event for many HOPE volunteers in Winnipeg because they often reunite with some of the children from the summer camps again. Why do the HOPE volunteers like this sort of work? This is the sixth year that HOPE Worldwide has been part of the Cookies with Santa evening, said team leader, Kimberly Potter. For HOPE volunteer Jacqueline Davis, this year’s Cookies event was her first as she had just relocated to Winnipeg from Edmonton. She got involved because her boyfriend has been part of HOPE, and Cookies with Santa, for a number of years. Davis was enjoying the event as she volunteered to do sports activities with the children. This year’s event also included a number of university students, including a group of 13 friends who came out to help with crafts and children’s activities. Her friend Nicole Raabe, who was also volunteering, said Cookies with Santa is a great opportunity to interact with families because she hopes to work with children someday as a pediatric surgeon. Costumed characters are also a part of Cookies with Santa, and this year was no exception. 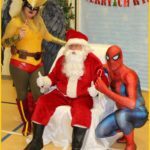 Along with Santa, who was played by retired CFS worker Ihor Wenger, two volunteers from the Costume Alliance – Kristin Dubois and Steve Roberts –portrayed Hawkgirl and Spiderman. The Alliance is a local organization with about 50 members who attend non-profit events for children, all on their own time. “It means a lot to us,” said Dubois. “Seeing their eyes light up, it’s amazing,” added Roberts. Along with volunteers, there were 99 families present at this year’s event and 245 children. For the families who had never attended, the event was a thrill. Another first-time foster mother named Jenny was equally impressed. “It’s larger than I thought it was going to be. It’s very vibrant.” She enjoyed the opportunity to meet other foster parents, as well as her foster child’s biological grandparents – they met for the first time at the Christmas event. “We got a picture with them. It’s a nice context for people to meet for the first time,” she said.